Presidencia site report the departmental flag as seen below (Previous Flag, ed.). My Spanish is not the best, but the description of the flag at <www.colciencias.gov.co> does not really match the reported image (Previous Flag, ed.). There's no image though. You're correct. It describe a horizontal tri-color, green-white-blue, with a red diagonal band (per bend or per bend sinister, not detailed) with the Guaviare flower at the center. I assume it to be 3:2. Notice that this site is of or just preceding 1997 because it refers to the proposed Department divisions. Could this be a former flag or an official flag that was later changed and never was hoisted? 4 Departments or states of my country have new flag designs. Those are. Guainia, Guaviare, Vaupes and Amazonas. The flag of Guaviare is with three stripes green, white and blue, in the center of the white stripe there is a mid sun in violet with 16 rays in blue. I have recently found a site for the Governorship of Guaviare, Colombia at <www.guaviare.gov.co>, and the flag they display is the reported Previous Flag. In the site there is also a picture of the Guaviare Flower (Flor del Guaviare) and a cleared Coat of Arms. The official site show now a photo of a flag and explanation as follows: "Diseñada por el educador NELSON VEGA CHACON, fue construida en satín con un largo de 2,40 mts por 1,20 mts de ancho. Distribuida sobre fondo blanco, de cada una de las esquinas parten dos franjas de color azul, que se juntan en centro y se prolongan unidas en una sola franja hasta el final del pabellón. Se conforma así un campo triangular de color verde que significa la riqueza y el pujante te esfuerzo de los colonos; el color blanco significa la paz, la honradez y el trabajo de las gentes de bien y las franjas azules se conjugan en una sola y simbolizan los ríos Guayabero y Ariari que al unirse conforman el río Guaviare." Wikipedia show a totally different flag. 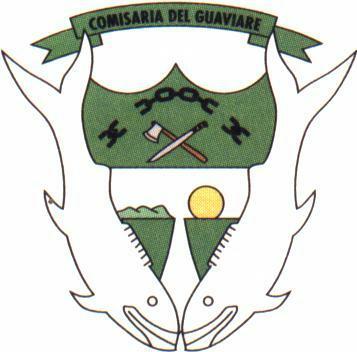 The flag of Guaviare is shown at <guaviare.gov.co>. The flag official proportions are 2.40 mts long x 1.20 mts wide, as designed by Nelson Vega Chacón. Also, the Coat of Arms was designed by José Antonio Escudero. However, the flag in the photo is not 1:2.